WASHINGTON, D.C. -- Uninsured Americans' likelihood of signing up for insurance differs depending on the amount of the fine they would have to pay for not carrying insurance. At a hypothetical $95 fine level, uninsured Americans are as likely to say they would not get insurance (46%) as to say they would (47%). At a $500 fine level, the percentage saying they would get insurance jumps to 60%, but this percentage levels off at a $1,000 fine level at 62%. The results are based on interviews with 4,829 Americans without health insurance as part of Gallup Daily tracking from Jan. 2-April 3, 2014. Uninsured Americans were randomly assigned to three groups, each testing respondents' likelihood to sign up for insurance under different fine conditions of $95, $500, and $1,000. Under the Affordable Care Act, also commonly known as "Obamacare," U.S. adults and their dependents must have health insurance or pay a fine. In 2014, the fine is $95 or 1% of household income, whichever is greater. The fine increases to $325, or 2% of taxable income, in 2015 and $695, or 2.5% of income, in 2016. These Gallup Daily tracking results provide a broad indication of how consumers would react to the three thresholds of fines. Health insurance companies and stakeholders believe the most important factor in the future pricing and overall affordability of health insurance plans could be uninsured healthy individuals signing up for insurance at similar rates to less healthy uninsured individuals. With this concept in mind, Gallup asked respondents to self-report their health as "excellent," "very good," "good," "fair," or "poor." This measurement has proven to correlate with self-reporting of chronic and expensive health conditions like obesity, high blood pressure, and depression. Across the various fine levels, adults with excellent or very good self-reported health are less likely to say they would sign up for health insurance than adults with poorer health. However, increasing the fine does increase the likelihood that healthier adults will enroll in a plan. 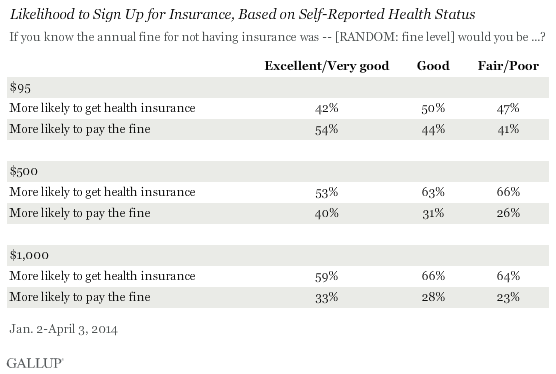 At the $1,000 level, a solid majority of Americans in all health groups measured report being more likely to sign up for insurance than paying the fine. The data show that respondents' political affiliation plays a role in their stated likelihood of signing up for health insurance. 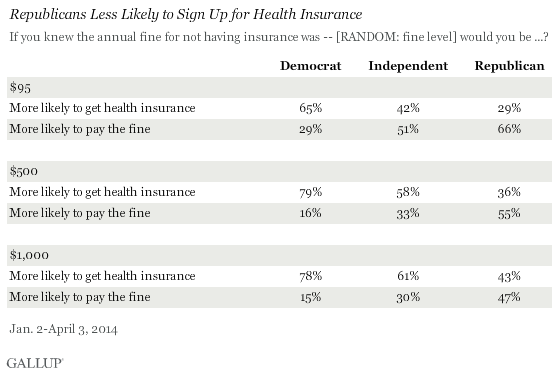 At each fine level, those who identify as Republican are about half as likely to report a willingness to sign up for health insurance as those who identify as Democrat. These political affiliation findings are consistent with earlier Gallup reports on how party identification affects Americans' attitudes toward the Affordable Care Act and uninsured Americans' intentions to get insurance. The increase in the Affordable Care Act fine next year to a minimum $325, or 2% of one's yearly household income, could compel a significant amount of still-uninsured Americans who did not sign up during the open enrollment period to do so in 2015. This increase could begin to taper off between the 2015 and 2016 tax years if the average fine moves between $500 and $1,000. At this point, there is a distinct possibility that the growth in the insurance coverage rate will either slow down or stall based on expected future fine levels. However, other factors such as public support for the Affordable Care Act and targeted marketing campaigns may help to close the insurance coverage gap even as the fines lose some of their ability to influence decision making. 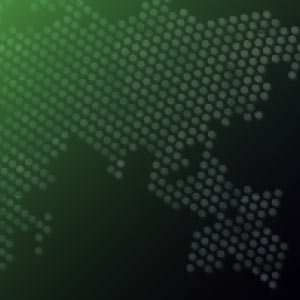 Results for this Gallup poll are based on telephone interviews conducted between Jan. 2-April 3, 2014, on the Gallup Daily tracking survey, with a random sample of 4,929 adults, aged 18 and older, living in all 50 U.S. states and the District of Columbia, who do not currently have health insurance. Each experimental fine level ($95, $500, or $1,000) was asked of a randomly selected third of the overall sample, approximately 1,600 uninsured Americans per condition. For results based on these samples of uninsured Americans, the margin of sampling error is ±3 percentage points at the 95% confidence level. In the U.S., the uninsured rate was 15.6% in the first quarter of 2014, down 1.5 percentage points from the fourth quarter of 2013. The uninsured rate is the lowest measured since late 2008.